JOHNSTOWN, Pa. — For six seasons, Tyler Kennedy was a key contributor for the Pittsburgh Penguins. Building his game on speed and physicality, “TK” was instrumental to the Penguins championship run in 2009. Now retired, Kennedy has been contributing to Pittsburgh in a slightly different way. The former grinder has found himself not only giving back to the community, but also building the sport in Pittsburgh and it’s surrounding communities. The former Penguin has recently participating in several dek hockey programs around the Pittsburgh area. Dek hockey has been an activity Kennedy has grown very fond of, but he added that dek hockey was an activity that he has enjoyed since his youth. 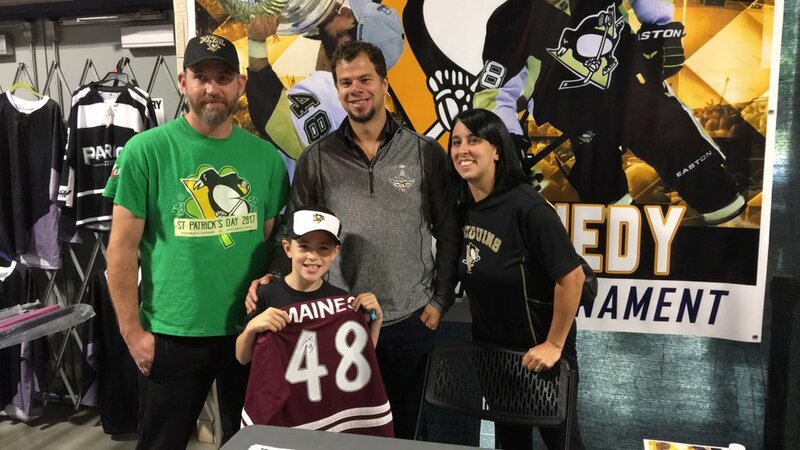 Kennedy has been very active in the Pittsburgh communities, and over the summer, Kennedy participated in several dek hockey tournaments in Pittsburgh. With many rinks already built in the area and many kids eager to play, Kennedy noted that the sport has continued to grow throughout all of Pittsburgh. Playing dek hockey is not as demanding as playing ice hockey would be. The price to play isn’t as high, the sport isn’t as physically demanding, and the sport itself is very easy to participate in. Kennedy cited the sports easiness as being a key reason as to why so many people are involved with the sport now. Bill Sullivan, who runs Greater Pittsburgh Dek Hockey in Penn Hills, agreed that dek hockey is an easy sport to play. Sullivan also thinks that people enjoy dek hockey because of how cheap it is to play. Dek hockey is something that has recently become very popular in the Pittsburgh area and Sullivan said there is a correlation between that and that increased interest and the success of the Penguins. The Pittsburgh Penguins Project Powerplay recently raised over $2.3 million to grow the sport of dek hockey in the area. Because of that project, 12 new deks were built in the Pittsburgh area. Kennedy said that becoming involved with the community is something that he has been very fortunate to do lately. He hopes that he is able to pass on his knowledge to the youth players in the area. Sullivan, who is also a scout for the London Knights of the Ontario Hockey League, believes that there is definitely something to be taken away from these programs. Kennedy officially concluded his hockey career after spending one season with the New Jersey Devils during the 2015-16 season. Since retiring, he has made the Steel City his new home. “Pittsburgh has become a home to me,” Kennedy said. “It’s a great place to live and it has everything my family’s looking for. It’s honestly a great place for me to be. Kennedy, who is a native of Sault Ste. Marie in Northeastern Ontario, found that Pittsburgh is a great place to start a family. After meeting the love of his life during his playing career, the now-retired winger decided to settle down in the city that started his career. Kennedy’s most notable moments were when he was a member of the Penguins 2009 Championship team. Even though Kennedy is retired, the Penguins are still a perennial contender for the Stanley Cup. One of the key reasons for the Penguins success, Kennedy said, was because of a few former teammates of his. Even though Kennedy is no longer a part of the team, he wasn’t shy to show a little bit of rooting interest for his former team. “They’re a great team and I’m excited to see what happens,” he said.